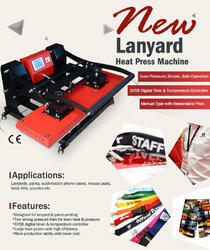 Lanyard heat press machine is specially designed for lanyard printing and pants printing. With two strong pressure bars,lanyard heat press distributes even heat and pressure, to ensure the best transfer result at center and 4 corners. You can also use this heat press for transferring sublimation phone cases, mouse pads, baby bibs etc for higher efficiency with such large size heat platen. More production ability with lower cost.